A first class singer, songwriter, and musician, Jerry Reed’s talents ran far deeper than his tongue-in-cheek persona might have indicated. Born and raised in Georgia, Reed played guitar from an early age. Music brought him comfort and structure during a childhood of instability. By the time he was out of high school, he was already signed to Capitol Records. Though he released several singles over the next few years, it was his songwriting and guitar playing that first earned him notice. A strong working relationship with Chet Atkins led to a contract with RCA and further raised Reed’s profile. By the late sixties, Reed was getting critical notice for his own records. He had his big breakthrough in 1970, when “Amos Moses” became a gold-selling pop and country hit. In 1971, ‘When You’re Hot, You’re Hot” became his first #1 country single and another big pop hit. Throughout the seventies, Reed matched popular singles and albums with high profile media exposure. He was a regular on Glen Campbell’s television show, and he appeared in several films. His greatest notoriety came as Cledus Snow in the wildly popular Smokey and the Bandit film series. “East Bound and Down” was recorded for the soundtrack of the first film, and became one of his biggest hits. The nineties brought a fun collaboration with Mel Tillis, Bobby Bare, and Waylon Jennings, a live album dubbed Old Dogs. Reed also starred as the coach in the box office smash, The Waterboy. Illness sidelined him as he aged, and he passed away in 2008 due to complications caused by emphyzema. Re. Jerry and Elvis–Jerry’s guitar work can also be heard on a couple of Elvis’ other vastly underrated 1967-68 songs: “Big Boss Man” (the Jimmy Reed [no relation] blues classic); Chuck Berry’s “Too Much Monkey Business”; and Jerry’s own “U.S. Male”, which got up to #28 on the Hot 100 in May 1968. There are those, Chet Atkins among them, who regarded Jerry as the greatest guitar player in the world. I’m not sure that I disagree as there are many fine pickers out there, but I am sure that there aren’t (and weren’t)any who are better than Jerry. I think his diffuse talents and film personality tended to distract from an appreciation of just how good he was. 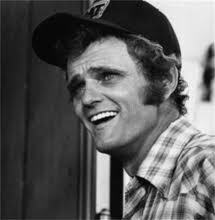 I quite enjoy Jerry Reed’s music and I know his guitar playing has a lot to do with it. I didn’t know it at the the time, but the first Jerry Reed song I ever heard was Brenda Lee’s “That’s All You Gotta Do”, solely written by Reed. Although I never thought of him as a songwriter, according to BMI he wrote 320 songs. Sometimes they show his name as Jerry Reed Hubbard or just Jerry Hubbard. He didn’t write one of my favorites, “She Got the Goldmine”. It was written by James Timothy DuBois. Brad Paisley should be taking notes from “She Got the Gold Mine (I Got the Shaft)” when it comes to writing clever, cute, fun and or pun-ey songs. That song right there is the template for novelty songs.